Though there’s been a ton of tantalizing news about Star Wars: The Rise Of Skywalker coming out from the Celebration event in Chicago, one particular moment from the recent teaser trailer has certainly captured fans’ attention. Indeed, that sinister laugh at the end of the preview sounds all too familiar, right? That’s because it’s the one and only Emperor Palpatine, the big bad from the OG Star Wars trilogy. Don’t just take our word for it, though. Writer-director J.J. Abrams has even gone on record to confirm that the Emperor will return in the forthcoming installment. 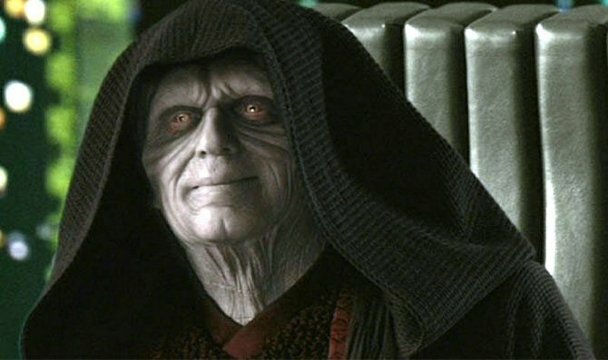 But the big question is: What part will Emperor Palpatine play in Star Wars: The Rise Of Skywalker? Thankfully, a source close to We Got This Covered has recently revealed some fascinating intel about the villain and his purpose in the final chapter of the Skywalker saga. As you should expect though, we’re going to be heading into spoiler territory here, so be warned. Our source tells us that the Emperor will be the main antagonist in Star Wars: The Rise Of Skywalker. This obviously means that Palpatine survived the fall down the Death Star’s shaft at the end of Return Of The Jedi. As a result, he was badly hurt, but has apparently spent his time healing as well as training and controlling Snoke, the arch villain of The Last Jedi. So yes, this means that the Emperor was behind Snoke all along. Furthermore, in Episode IX, we’ll be seeing Palpatine hiding out in a Death Star, the one that was seen in the recent trailer. The heroes will also need to head there at some point to kill him, presumably during the climax of the film. Interestingly, this all seems to fit. The fact that Luke Skywalker says the words, “No one’s ever really gone” in the trailer certainly foreshadows the idea that someone important will be making a return. It does, however, throw up a problem. Mainly, Darth Vader’s character arc loses a little bit of honor if Palpatine survived, as he ostensibly failed to kill his master at the end of Return Of The Jedi. Granted, Vader still saves Luke from certain doom at the hands of Palpatine, but his arc definitely loses a little magic if the Emperor is indeed still alive. Another angle though is perhaps the villain’s physical body was atomized in the explosion of the Death Star but maybe his dark ethereal life-force lives on? Whatever the case may be, there are still many questions to be answered and unfortunately, we’ll have to wait until the eagerly anticipated Star Wars: The Rise Of Skywalker launches into theaters on December 20th. In the meantime, though, feel free to begin speculating in the comments section down below.